The new PROSTAFF 7i 6x21 Laser Rangefinder gets you on target with speed, precision and consistency – a necessity to effectively use Nikon's BDC reticles and Spot On™ Ballistic Match Technology. 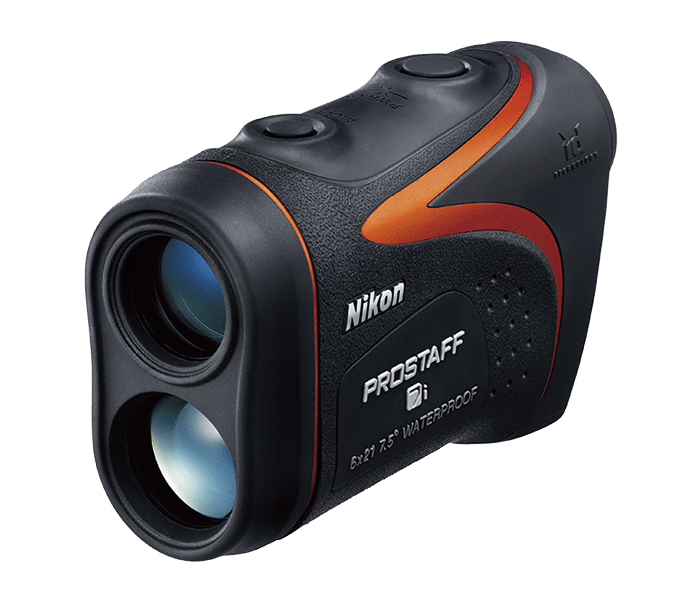 This rangefinder features 8-1300 yard ranging capability, multilayer coated optics, waterproof ruggedness, pocket-sized portability, long eye relief, Tru-Target™ Priority System and Nikon's ID (Incline/Decline) Technology for horizontal and actual distance display. Nikon's advanced ID (Incline/Decline) Technology provides the horizontal distance to the target, even when ranging at various incline or decline shooting angles up to an incredible +/- 89 degrees (nearly vertical up or down). For fast, easy measurements, the single button operation of the PROSTAFF 7i Laser Rangefinder is simple to use and automatically powers down after 8 seconds to reduce battery use. The uncluttered screen displays ranges with Nikon's trademark speed and accuracy in .1-yard intervals out to 1,000 yards, 1-yard increments over 1,000 yards. The PROSTAFF 7i Laser Rangefinder conveniently fits in a pocket or a pack, and can be worn on a belt without interfering with your shot. Comfortable to carry and use all day long in any of the toughest situations your hunt can present. The new PROSTAFF 7i Laser Rangefinder gets you on target with precision, speed and consistency – a necessity to effectively use Nikon's BDC Reticles and Spot On™ Ballistic Match Technology. Incredible 18.3mm eye relief allows for easy, comfortable viewing. Made to withstand even the worst conditions, the PROSTAFF 7i is waterproof/fogproof and the battery chamber is water resistant.